Kick off your social media efforts today with Establishing, Managing, and Protecting Your Online Reputation: A Social Media Guide for Physicians and Medical Practices, a comprehensive resource not available anywhere else. 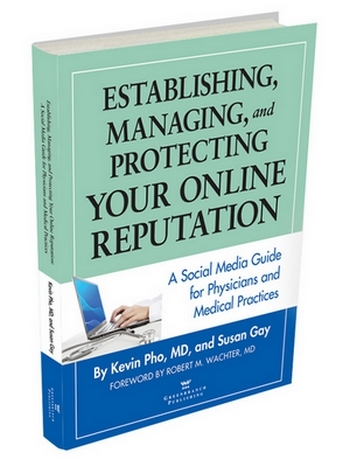 In addition to unique insights from practicing physician and social media pioneer Kevin Pho, MD, this book offers doctors a step-by-step guide on how to use social media to manage an online reputation. It also provides insider tips on how to respond to online ratings and a guide to work with all of the major physician review sites. Don’t let others define you on the web. Take control of your online reputation now! Written by Kevin Pho, MD and Susan Gay. Dr. Pho’s blog, KevinMD.com, is social media’s leading physician voice, with over 100,000 subscribers on Facebook, Twitter, Google+, LinkedIn, and RSS. He is a contributor to USA Today, CNN, and the New York Times, and has been cited regularly by major media. Backed by evidence, enhanced with stories! Dozens of anecdotes and case studies from social media leaders like Vineet Arora, MD, Katherine Chretien, MD, Natasha Burgert, MD, Dave deBronkart, Susannah Fox, Kerri Morrone Sparling, Wendy Sue Swanson, MD, and Bryan Vartabedian, MD. The Foreword is written by Robert Wachter, MD, Professor of Medicine at the University of California, San Francisco. His blog, Wachter’s World, is one of the nation’s most influential, and Modern Physician has ranked him as one of the 50 most influential physicians in the U.S. for each of the last five years, the only academic physician to achieve this recognition. Endorsements from Abraham Verghese, MD, Eric Topol, MD, Jerome Groopman, MD, Pamela Hartzband, MD, George Lundberg, MD, Paul Levy, Sandeep Jauhar, MD, Mike Sevilla, MD, and many others. “I Google myself periodically, which has taught me about some of the misinformation on doctor review sites. I’ve since corrected a few errors. Now I realize I should do it more often and am considering starting a LinkedIn account! “Medical practice reputation and branding by social media has been on my high-priority list. This book will be significant for every healthcare executive, physician leader, and governing board member! The content is clear, concise, and highly informative. It summarizes benefits, business opportunities, and threats, and provides specific go-to resources. The content calls out social media influences, both positive and negative, generating an awareness of the need to address the opportunities and risk immediately. The case examples are brief and resonate the must do implementation of policy and guideline structure within the practice and for physician members. This implementation planning guide responds not only to the ‘business’ of medicine but to the progression regulatory mandated transparency. The time investment in reading (significantly quick and interesting … not tedious in any manner) becomes a double pay back. I found it stimulated me to take immediate action while the information was fresh and I plan to keep it close at hand as a book shelf resource reference and coaching material as my social media policies and procedures evolve. Dr. Pho and Ms. Gay have provided the busy healthcare executive with the tool kit of content for governance regarding social media exposure and a comprehensive resource list to build the policies. After reading this material I was curious and compelled to immediately investigate resources suggested. I was astonished what I learned about our practice at social media sites. No more resting on our ‘reputation and laurels’ of 26+ years of community contribution and service! “It takes a lifetime to build a reputation but only a single act, blog, email, online comment, Facebook post, texted picture, or Tweet to destroy it. That’s because online communication may go massive instantly. And it’s the reason the ‘mainstream media, including medical journals and medical television, have editors and peer reviewers and build in a delay factor. Keeping egg off authors’ faces, protecting authors from themselves, and protecting readers are key roles for editors and peer reviewers. "As the digital era inevitably invades the medical cocoon, there is a vital unmet need for physicians to adapt, especially to new challenges such as dealing with one's online reputation. Kevin Pho, a leader in the convergence of social media and healthcare, with Susan Gay, provide a comprehensive and extremely useful roadmap for doctors. Instead of default, sitting duck status, this information and perspective enables physicians to take charge." "The book is an excellent and helpful resource. But what elevates it beyond the category of valuable how-to manual is the passionate call to arms that resonates from all those well-enumerated directions and clearly labeled diagrams. Like it or not, the authors warn, the Internet has profoundly changed the patient-doctor relationship, and doctors must embrace its effects on patient care — or risk losing their own influence. This is a social media manifesto for physicians." "This book is the newest, most comprehensive, most detailed and up-to-date reference source available to American physicians and medical practices. Richly nuanced by America's most popular and authoritative physician blogger and social media expert, it can guide you through this swamp—maybe not clean, but ready to move forward." "This book is sensational. It provides an argument that wins hands-down on how doctors no longer have the luxury of ignoring social media and its impact. This book will help physicians understand and prepare themselves for social media’s impact on their future." "This must-read book is a primer on the essentials about why your medical digital footprint is important and how to best manage it. It also chronicles the path of Dr. Pho from the beginnings as an internal physician and patient advocate from New Hampshire to today as social media’s leading physician voice via his very popular website, KevinMD.com." "Dr. Pho has compiled his years of experience and knowledge into a fantastic book that should be considered required reading for all doctors. Social media is the future of doctor–patient communication, and this book provides a comprehensive guide to navigating the social media arena. From LinkedIn to Facebook, to Twitter, to Google+, readers will learn how to become the maestro of their online reputation, marketing, and communication with patients."